International Lithium Corp. A Potential Source For Green Technology Minerals. 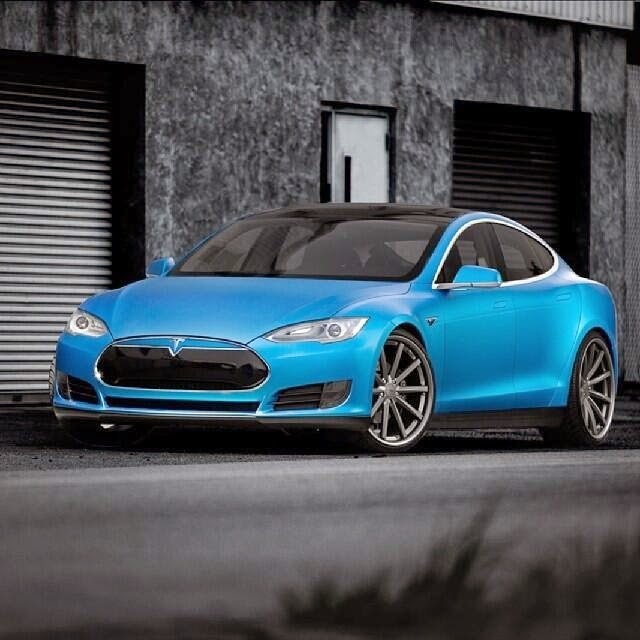 Rare Earth elements or metals (REEs) are essential elements in clean-energy technologies. In recent years REEs have received plenty of coverage concurrent to growing environmental concerns. The rare-earth topic is no longer obscure and discussions regarding future REE shortages are beginning to emerge in mainstream media. Today international governments and organizations are pushing efforts to develop solutions to the rising scarcity threat, one of the biggest being that only 1 percent of critical materials are currently being recycled (they are difficult to recover economically), and so the race to find viable sources for REEs is on. The Green Technology Industry is the largest end-user of REEs and is continually growing with the development of electric vehicles and green energy electrical generators; wind turbines and solar panels. According to the American Chemistry Society, Lithium is among these endangered metals. China, which controls 97% of global rare earth production, has made significant investments in securing their supply. One excellent example of this is the recent news from China based Ganfeng Lithium Corp. regarding their 15million yuan (US $2.4 million) investment into International Lithium’s Blackstairs Pegmatite project in Ireland and the Mariana Brine project in Argentina for the 2014 budget year. Ganfeng Lithium Corp. is one of the largest lithium product suppliers in the world supplying ILC with both capital and expertise and providing the global green technology industry with a new potential source of lithium supply. Ganfeng’s transaction signifies confidence in ILC’s capabilities as ILC is currently one of the only publicly traded Canadian Corporations receiving funding from China after the collapse of the multi-million dollar CNOOC/Nexen deal. 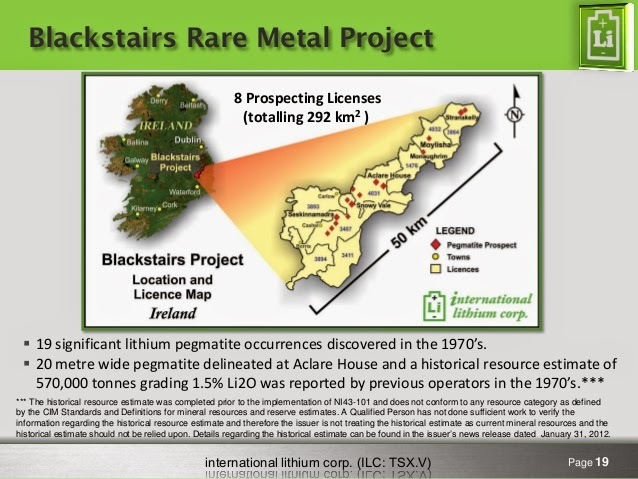 The Blackstairs Lithium project in Ireland is particularly momentous as a recent European Union study concluded that rare earth supply constraints could hamper clean energy efforts. Ireland has pledged to make the mining process more efficient as part of an approach to boost lithium production. Subsequent to the Blackstairs funding announcement, Jianguo Xu, Chinese Ambassador to Ireland, paid a courtesy call to Richard Bruton, Ireland’s Minister for Jobs, Enterprise & Innovation, to discuss how to promote pragmatic and mutually beneficial cooperation between the two countries. Beyond the growing demand and investment from Chinese conglomerates, encouraging headlines have also come out of Argentina, which is home to ILC’s Lithium-Brine Project located within the famous Andes Lithium Triangle. The political tide appears to have made a turn for the better this year as governments in Argentina took positive steps towards modernizing public policy to encourage foreign investment. Not only was the national currency devalued to bring it closer to its real value but new economic systems to measure real impacts of inflation were implemented. The settlement with Spanish oil giant Repsol over the YPF nationalization is another indicator that change for the better is in the works. In addition, an unprecedented debt repayment deal was struck with the “Paris Club” of creditor nations, and Lumina Copper’s announcement that First Quantum Minerals has agreed to purchase the Taca Taca copper project for $470 million should help to shore up lingering doubts about the direction Argentina’s mining industry is headed. 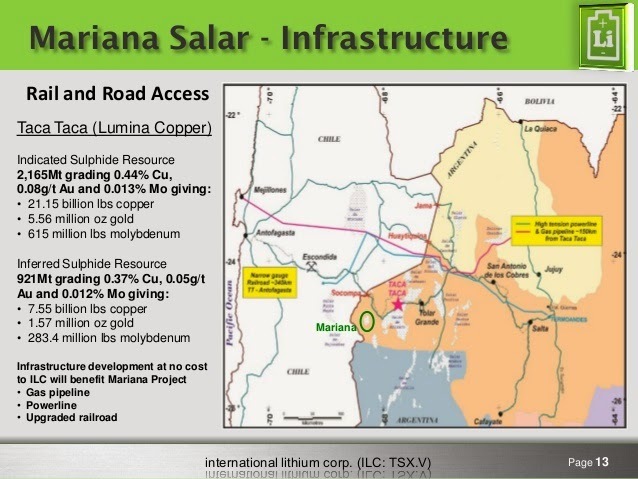 Taca Taca is approximately 70 kilometres from ILC’s Mariana project and any infrastructure built to facilitate production at Taca Taca will also benefit Mariana. ILCs goes beyond traditional mine development and is creating a business model that is focused on cooperation and growth. 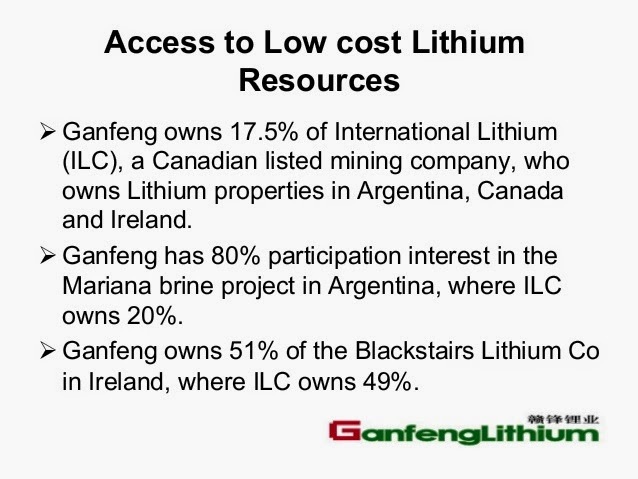 Ganfeng Lithium and ILC are jointly working on a vertical integration plan to develop both lithium projects and have just announced an exploration budget for 2014. 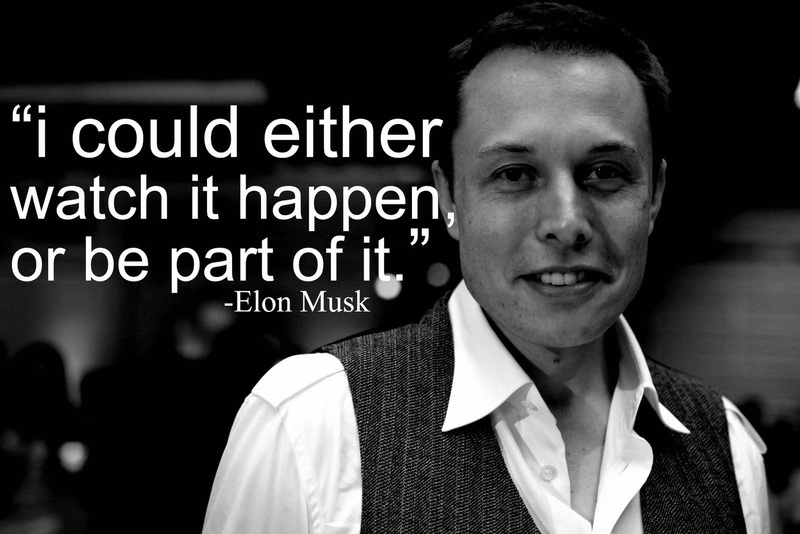 With the REE demand growing and Tesla’s big Open Source move, this venture could not have occurred at a more opportune time. "Jim Puplava discusses the groundbreaking developments in Switzerland where the real democracy can be in action now. 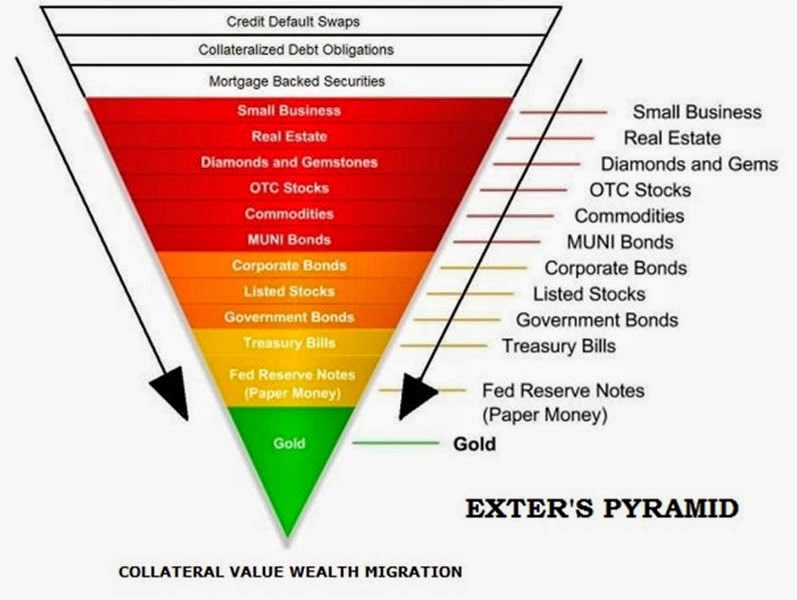 Even debates about the Gold and Money Printing will be unprecedented on the national level and if this decision finds the support of the people Central Planers will be in horror." End Gold Manipulation: The Stunner From Today's Round Table Debate To "Fix" The London Gold Fix. "As those following the saga of the rigged for decades and soon to be history (in its current incarnation) London gold fix know, today was the date when the World Gold Council held its "Modernising the London Gold Fix: IOSCO and beyond" round table session. Specifically, as the WGC explained, "The World Gold Council will be holding a round table debate on the reform of the London Gold Fix and the modernisation of the London gold market. Many aspects of the existing price benchmark process are viewed favourably by market participants, however, other elements are in need of reform if IOSCO compliance is to be achieved. The World Gold Council is seeking views from both users and service providers on the optimal characteristics of any reformed system. We will also debate whether IOSCO compliance is enough or should the industry be seeking to modernise more than just the price benchmark?" ZeroHedge." I Vote To End Gold Manipulation: FSA Fines Barclays For Manipulation Of Gold Price - Join Me. "Manipulation cannot lasts forever even if the very powerful forces are behind it. 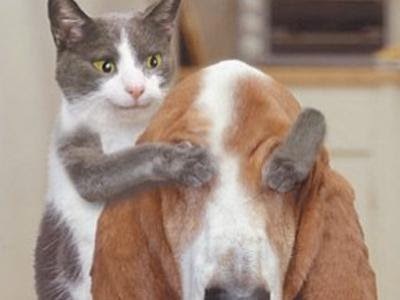 You already know that I am not talking here just about one trader, one bank or even one country. We are talking here about the highest levels of power involved in this masquerade. Why Gold is so important for everyone, not just for the super wealthy who can afford to put it aside for the rainy day? Gold is the most important indicator of the rate at which FIAT money are losing its value - its real purchasing power. If you can manipulate it - you can pretend that everything is fine and DOW and S&P 500 will beat All-Time-High every month as we have now. But just look below at your childhood McDonalds Menu - something is not so right, isn't it? My personal vote is nothing, but if I am not alone it will be finished one day. Please donate your tweet for the good cause and share this post if you want to change it as well. 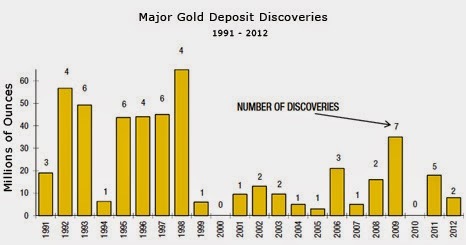 TNR Gold: Shotgun Gold Project - Why Do We Need New Gold Deposits? "This picture above is stronger than thousand words written by the FED's hired academics and even Austrian School of Economics - it cuts through the verbal mist to the bone of Inflation definition and what it really means. It means that your FIAT money are losing it purchasing power. It happens every day, day by the day. 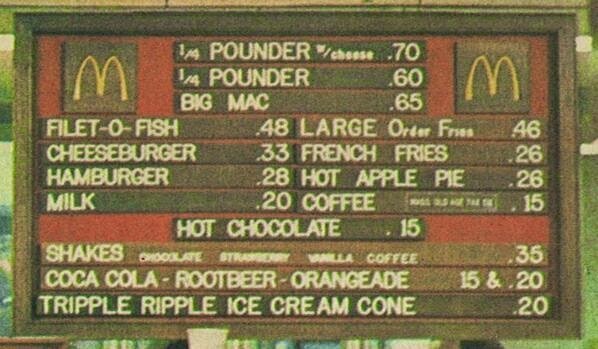 How much you can see from the McDonald's menu from 70s. 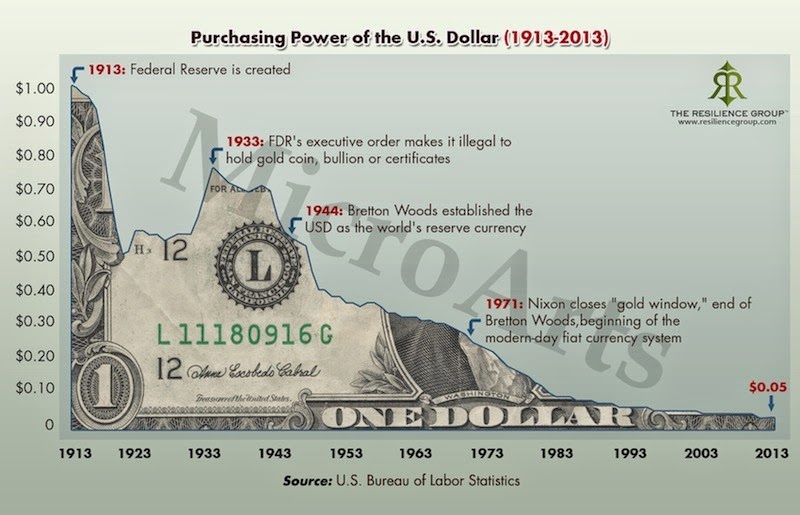 And below is the chart representing "Strong US Dollar Policy" in action implemented by FED from the day of its inception in 1913. Some people even think that Federal Reserve is as Federal as Federal Express, but we will not go that road today. 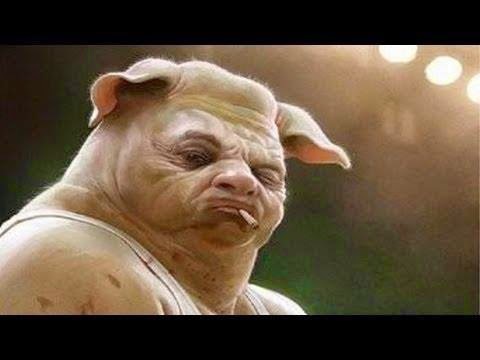 Inflation is the dirty open secret of all Central Banks in the world. It creates the Inflation Tax by gradually stealing from the value of your savings and deflating the government's obligations on all social programs. It is the way for governments to finance wars and "Inflate away" their debts without taxing you "directly". Inflation follows currency debasement - organised by money printing or by QE in the iPad's century - and it is making its dirty work by itself. I will address you to James Rickards' books: "Currency Wars" and "The Death of Money" to get more information in depth on these subjects and Gold Manipulation is widely discussed on the web today. Read more." Market Manipulations, NI 43-101 And How The Honest Person Can Survive In Junior Mining. 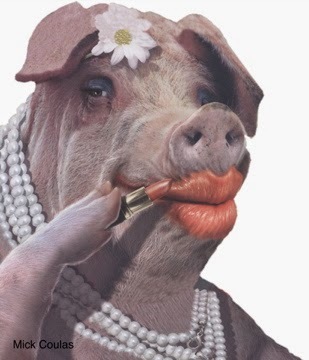 "Manipulation is rampant in all markets: HFT Flash Boys, LIBOR, FOREX, Pensions, Energy ... Gold. Some of the former conspiracy theories are going in the court rooms now, others are still waiting for their time. 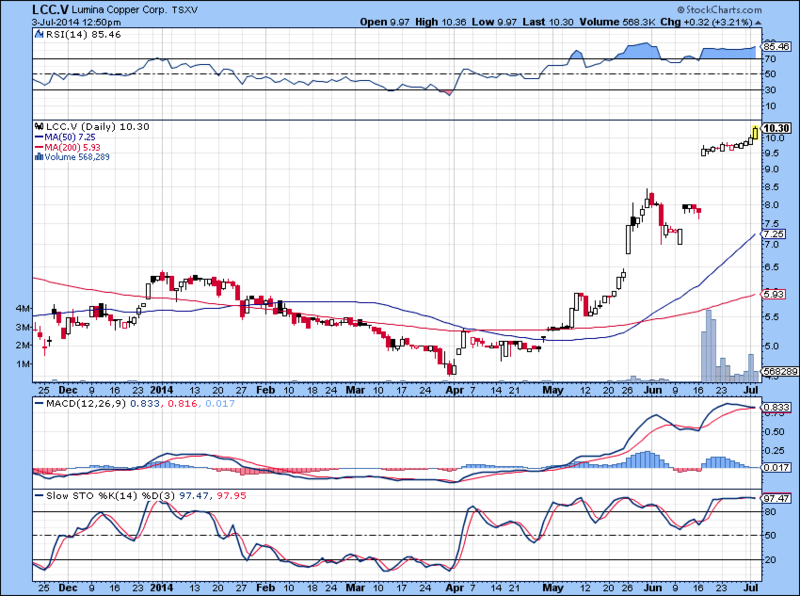 But nothing could be compared with naked shorting and manipulations in the illiquid junior mining stocks. Dirty tactics are used all over the market like the banging the juniors into the close, suppressing the prices during the accumulation. You can get the idea from the reports made by Jim Puplava on Financial Sense and the summary: Naked Short Selling: The Problem. Not a lot of people are talking about it - not a lot of us have the voice. And that is the real problem. Read more." Mining M&A: China's Top Gold Firm Talking To Barrick And Friedland As Copper Rallies. 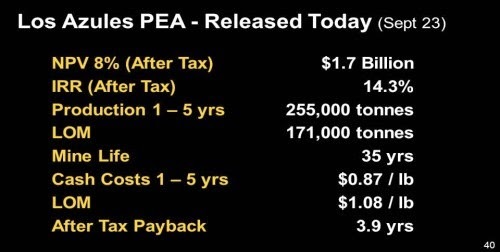 All slides in this part of the post are from McEwen Mining presentations. We have only one question and concern, as you know. 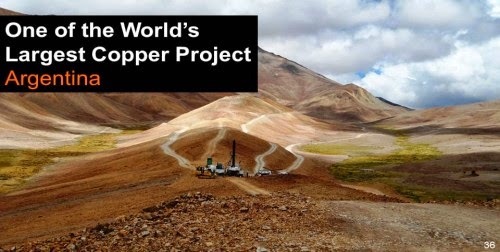 Why McEwen Mining is not properly working with Los Azules Copper project now? It is the world-class asset and "One of The World's Largest Copper Projects" according to Rob, why there is no appropriate marketing of it? Its proper sale will solve all capital problems which McEwen Mining is facing now in order to grow further. 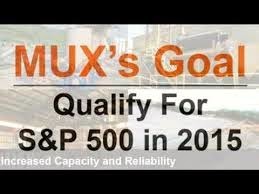 We all have noticed the change in the company's goal - now S&P 500 target is not possible by 2015, but it is the great company with the great leadership, why Los Azules Copper has not being promoted properly so far? 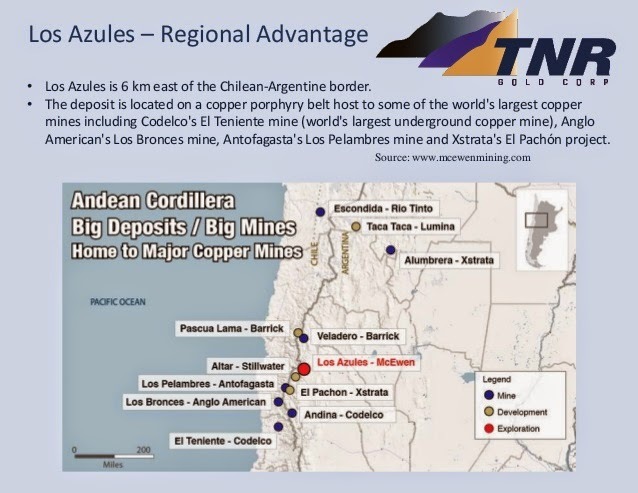 TNR Gold is moving forward with its Los Azules Copper Back-In Right asset and nobody is going to sell it cheap as it looks like now, so why is McEwen Mining not using the better climate in Argentina and rising Copper prices to tell its story? The irony is here that: "soft Gold and Silver prices are due to the economic recovery" - what can be better hedge from "such an adversary" for the Gold Miner as Copper World-Class asset in this case? We would take it any day now as Chinese may one day. 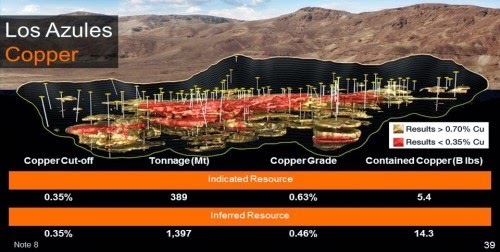 Copper M&A: Lumina Copper Hits CAD10.36 - Is Another Bid Coming For Taca Taca Now? Let's see what the next couple of weeks will bring us here. I will repost my yesterday's entry and you will appreciate later why it is important. Now Los Azules Copper will be making its rounds in the industry. "China's largest gold mining company, China National Gold, is officially setting up shop in junior mining hub Vancouver this week as part of a push into new markets and its global acquisition strategy. "The growing strategy is very clear, we are going out looking at things globally. On our hands we have a few opportunities, at different stages." Song, who also chairs the China Gold Association, has not ruled out acquisitions in developed countries, such as Canada, Australia and the US, but the main focus of its expansion strategy is assets in the region including in Mongolia, Russia and countries in central Asia. Investments in "politically stable" countries in Latin America and Africa are also being considered Song said. Mining.com"
"We are working on the corporate structure now, which will allow to develop Shotgun Gold with the potential new strategic partner on J/V basis like we are doing with Ganfeng Lithium in International Lithium. You can find more information in the Shotgun Gold Project presentation below, on our website and give us a call to discuss it at any time. Read more." Gold smells Inflation and is moving higher these days, Chinese quest for resources will bring new deals into the mining M&A space and projects like Shotgun Gold will be on the radar screens of investors again. 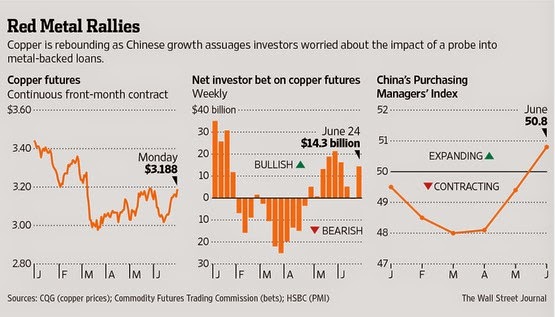 "Some investors are turning bullish on copper prices, brushing aside concerns sparked by a probe into the metal's place in China's financial system. Instead, these investors are focusing on a rebound in manufacturing world-wide, which they expect will boost copper demand broadly. Increasing consumption by factories will offset any decline in the use of copper as collateral to back loans as a result of the probe, these investors say. China is the world's biggest copper consumer and importer, though how much of the metal goes to manufacturers is unclear. WSJ." 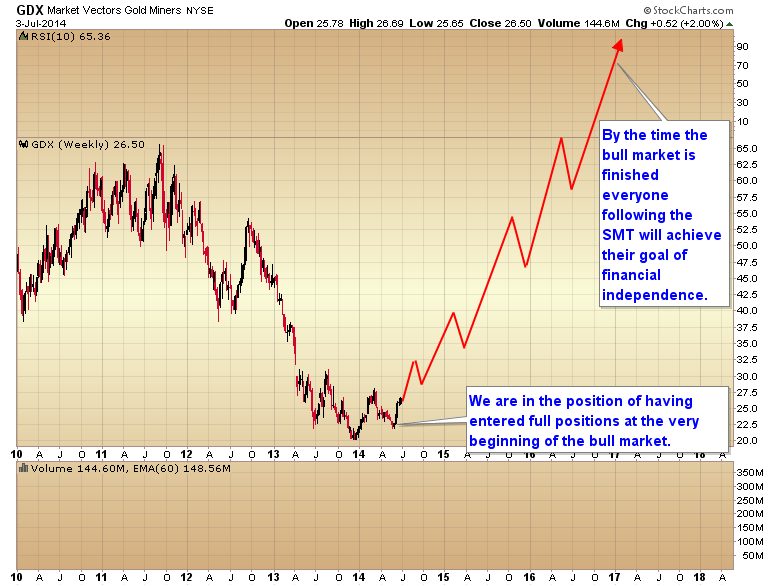 Bullish For Metals?! Missing Collateral in China, Follow The Trail of Loans, Copper and Fraud. "In my personal opinion, we are witnessing the same game of the rehypothecation as it is happening with FED, BIS, Investment Banks and Gold. 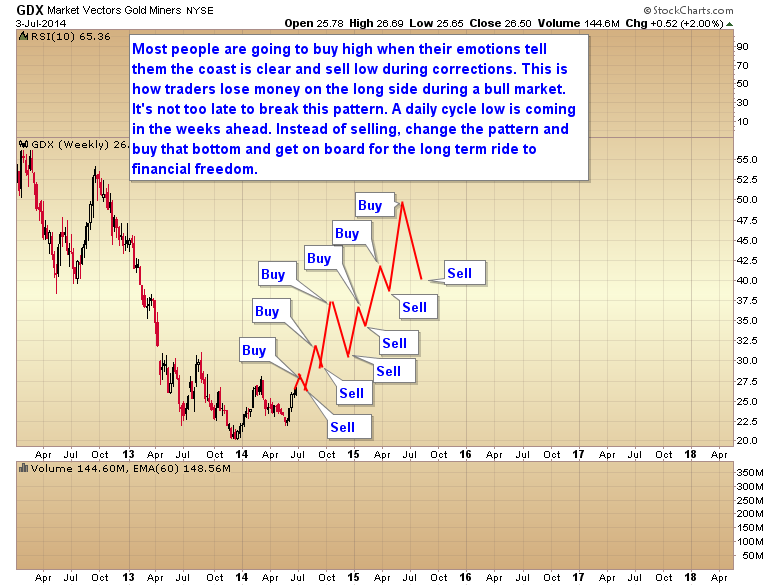 This, actually missing metal as collateral, will be the very bullish set up for the commodities markets. After initial selling due to the margin calls and unwinding of Paper Positions in the market, Mr Market will realise that all these metal accounted for the supply and demand picture is NOT there. Industrial demand will stay in place, but Supply which was supposed to be hoarded in the warehouses is missing: the collateral was used a few times for the different transactions. Read More." 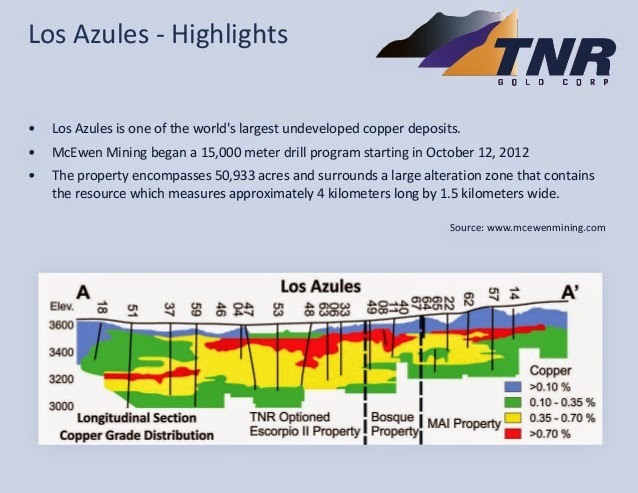 TNR Gold Los Azules Copper: Chinese M&A - Watch Out For Las Bambas Effect. "Frik Els provides a very good insight into the Chinese deal culture and mining M&A particularly. Las Bambas deal is not only the very good indicator of the turning mining cycle, but also provides guidance for the smaller companies in China to go on The Hunt For Copper and other commodities. You can witness this approach in our particular case of Strategic Commodities with International Lithium and Ganfeng Lithium as well. Read more." TNR Gold: Los Azules Copper And M&A in Argentina - First Quantum Minerals to Acquire Lumina Copper For $470 Million.